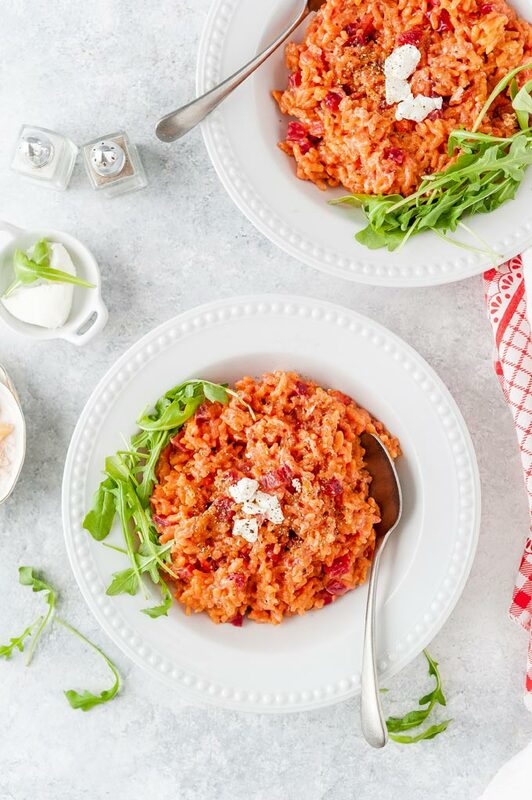 Instant Pot Beet Risotto is made in under 30 minutes. It’s rich, creamy, and delicious. Tangy and salty goat cheese pairs beautifully with sweet and earthy beets. The combination of flavours and textures makes this Beet Risotto a satisfying and elegant meal. After some discussion it turned out that they were making mushroom rice. Definitely quick. Definitely delicious. Definitely not risotto. Risotto is opposite of quick. Risotto is the meal you make when you have no kids or your kids are adults. Even if your kids are away for a weekend or a playdate, you still do not make risotto. Your time is better spent doing some extremely rare and extremely enjoyable activities, such as taking a long and uninterrupted shower, or drinking and actually finishing a hot cup of coffee. Risotto is the no kids and kids aren’t coming home in the next week kind of recipe. It’s the recipe you cook when it’s gloomy outside on a Saturday afternoon and you listen to light jazz and you sip a glass (or two) of white wine and you anticipate the rest of the weekend to be just as slow and as delicious as the risotto you are making. Making risotto, real risotto, stove-top risotto, isn’t difficult but it requires time and finesse. The rice is cooked little by little when ladlefuls of hot broth are added to a pan at a time. The rice is constantly stirred and the rubbing of individual grains and slow cooking time produce starches which make the resulting dish rich and creamy. Cooking risotto is a meditative experience. But who has time for that? Certainly not me! 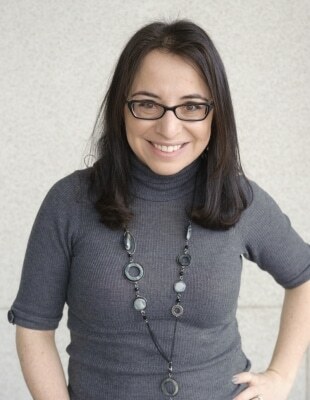 So, Instant Pot to the rescue! When I first got my Instant Pot I was disappointed. I expected a magical appliance that would cut all my cooking time in half or more. That never happened. Instant Pot is amazing with cooking slow braises and stews at much faster rate but most other meals I cook in my Instant Pot aren’t really much faster than if I made them in the oven or on the stove. However, the reason why I love, no, adore, Instant Pot is the convenience that it affords me! I don’t have to watch the pots and pans on the stove. I can adopt the set it and forget it mentality and go about my day. Cooking with Instant Pot is quite similar to cooking in the oven for me. It’s the similar idea of not needing to constantly check and recheck the pans. 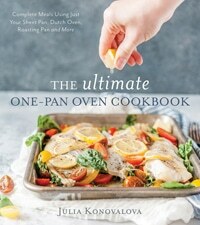 If this is something you need in your cooking, then check out my first cookbook, The Ultimate One-Pan Oven Cookbook, it has 75 original recipes, all made in the oven, all made in one pan. If you are still on the fence about buying an electric pressure cooker then read my article on 7 Things You Need To Know About Instant Pot. And if you already have this almost-magical appliance, then check out my guide for 9 Ultimate Instant Pot Accessories You Need to Buy. 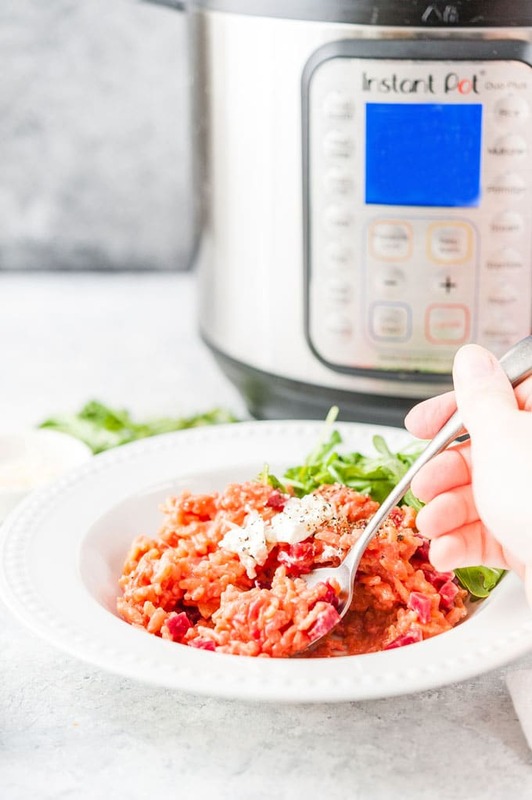 So, now I make Instant Pot Beet Risotto in almost no time. It’s rich, it’s creamy, and, most importantly, it’s delicious. Tangy and salty goat cheese pairs beautifully with sweet and earthy beets. 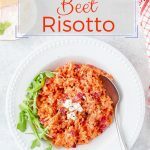 The combination of flavours and textures makes this Instant Pot Beet Risotto a satisfying and elegant meal. It also requires almost no hands-on cooking time. 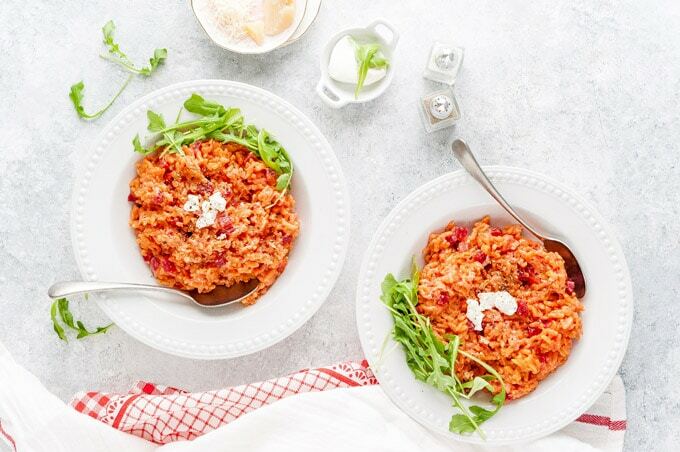 All you need to do is cut up some vegetables and measure out all the ingredients, thus making Beet Risotto an ideal dish to make for Valentine’s Day. I mean, look at this gorgeous colour! Why make risotto in Instant Pot? Making Instant Pot Risotto means you don’t have to stand at the stove and add ladles of broth at a time. Oh, and stir. And stir. And stir some more. Instant Pot Risotto is one of those recipes that is actually pretty instant. Yet the result is delicious, rich, and creamy, just as risotto should be. 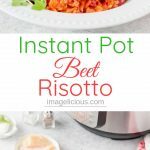 This particular variation, Instant Pot Beet Risotto, is simple, easy, delicious, yet impressive and very elegant. Its beautiful colour makes it perfect to serve for a special occasion such as Valentine’s Day or Mother’s Day. It is also naturally gluten-free which makes it perfect to serve at dinner parties where people have intolerances or dietary restrictions. 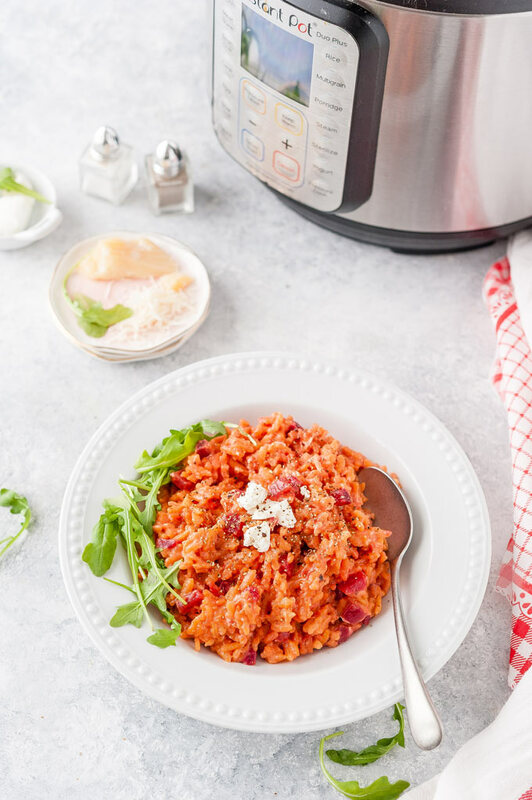 Making Instant Pot Risotto is very easy, although it requires a little bit of thought. For example, if you are making mushroom risotto or Instant Pot Beet Risotto like I do in this case, you can add the vegetables together with the rice, as they’ll cook at the same time. However, a more delicate asparagus or shrimp risotto would mean that the vegetables or seafood need to be added after the risotto is cooked. (Optional step) Sauté onion and garlic on a little bit of oil or butter in Instant Pot. You can omit the step of actually sautéing if you don’t have time. If you sautéed the onion, then deglaze the pot with a bit of liquid. Add the short grain rice. Most commonly used rice for risotto is Arborio rice. Do not rinse the rice first!! Add broth in the ratio of 1 cup arborio rice to 2 cups broth. Seal the pot and cook on high pressure for 6 minutes. If you are not making a vegan risotto, then add parmesan cheese and a bit of butter to the risotto and mix. 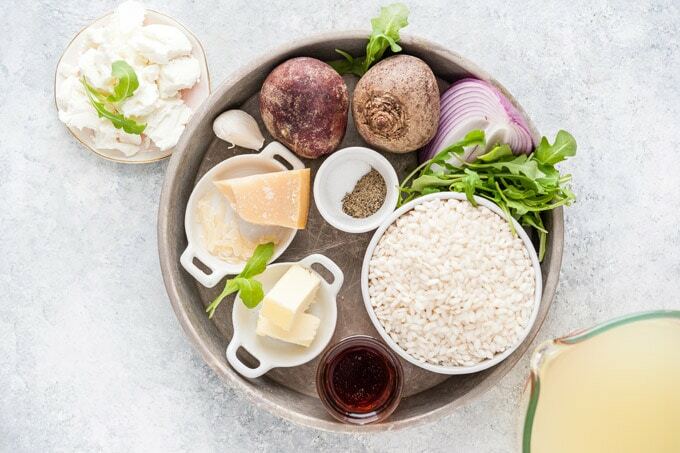 TIP for making Instant Pot Risotto: Sauté the onion and garlic while you are chopping the beets, this way you are adding a bit extra flavour to the risotto, also preheating your Instant Pot but not adding any extra time to the whole cooking process. Making Instant Pot Risotto is actually pretty quick and it requires almost no hands-on cooking time. For my model of Instant Pot, it takes 9-10 minutes to come to pressure, then 6 minutes of cooking on high pressure, and about 2 minutes to release the pressure. That’s 17-18 minutes. 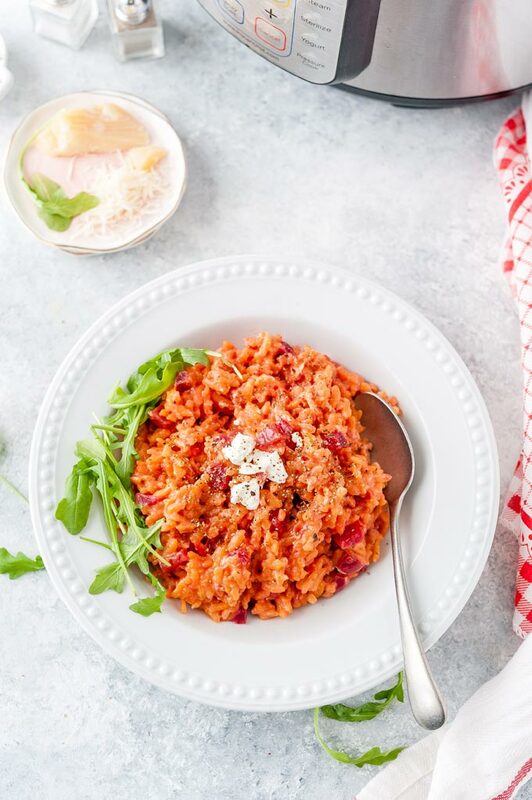 If you are making Instant Pot Beet Risotto then you can add another 8 minutes to chop and prep the ingredients and let’s go all out and add another 5 minutes to sauté the onion. So, altogether, Instant Pot Beet Risotto will take about 30 minutes from start to finish. 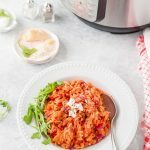 Can you make Instant Pot Beet Risotto vegan? Traditional risotto is usually finished with butter and parmesan cheese to create an extra creamy texture. However, arborio rice and the ratio of grains to broth create a very creamy texture on its own. 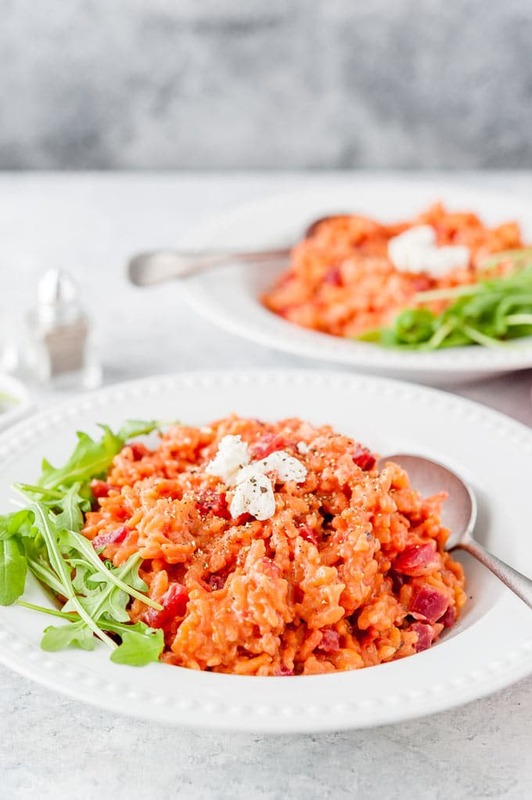 So, you can replace butter with oil and omit any cheese to create a vegan version of Instant Pot Beet Risotto. You might need to adjust the seasoning. Parmesan and goat cheese are quite salty, so salt would need to be increased to taste. Also, goat cheese adds a wonderful tang to the dish. I’d suggest adding a little bit of lemon juice instead. 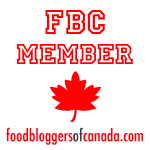 Beets have lots of beautiful red juices that will colour everything from your hands to the cutting boards you use, so there are some tips for you when you cook with beets. Beets often lose their colour when cooked and turn from beautifully red to orange. Lemon juice (or even vinegar) is supposed to help the colour stay true red. Can you keep leftover risotto? There’s no risotto police, so technically you can keep your leftover risotto and I in no way encourage you to throw it away. However, risotto will not be creamy and smooth after a few hours in the fridge. The beautiful coating will absorb into the rice, making it quite sticky and soft. It doesn’t mean that you have to eat every little bit of risotto right away or never make it. One of the more famous Italian appetizers is called Arancini and it is just fried risotto balls, often stuffed with cheese. Delicious! Here’s a beautiful recipe for Arancini with Easy Marinara sauce from my friend Dawn of Girl Heart Food. I personally am terrified of deep-frying so I have never made arancini myself. If I have to reheat my leftover Instant Pot Risotto, I usually do it on a pan. I spread the risotto in a thin layer and pan fry until the bottom is crispy. I then try and flip it over as well as I can and fry on the other side. It’s delicious! Optional step: Press sauté button on your Instant Pot, add half the butter and sauté the onion and garlic for about 5 minutes. Alternatively, if you are not using sauté function, then add half the butter, diced onion, and minced garlic to the Instant Pot. Add the rest of the ingredients except all the cheese. Mix. Press Manual or Pressure Cooker button (depending on your model) and using the arrow buttons set the cook time to 6 minutes. Depending on your Instant Pot model, it'll take around 9-10 minutes to come to pressure. Once the Instant Pot beeps that the 6 minutes of cooking are done, do a quick release. This will take about 2 minutes. Add the rest of the butter, grated parmesan, and goat cheese. 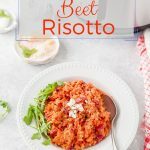 Mix well until everything melts together and Instant Pot Beet Risotto is creamy and luscious. Serve with extra cheese and arugula if desired. I like serving this Beet Risotto with arugula. It provides a nice visual and textural contrast as well as great flavour.